Harness the power of the triforce to protect your goods! 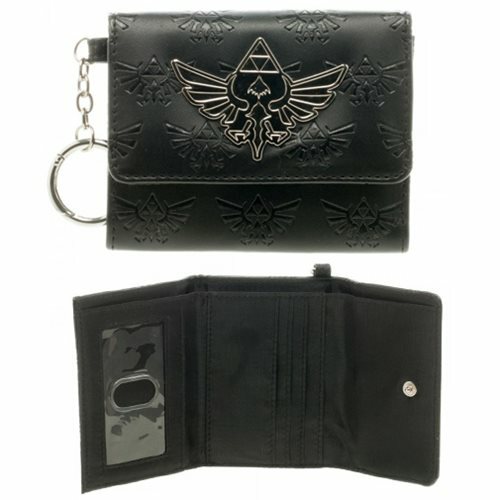 Made with a touch of synthetic leather, this Legend of Zelda Mini Trifold Wallet features the iconic triforce symbol debossed throughout this sleek wallet and topped with a metal triforce on the front. Perfect for travel, this trifold wallet is fully designed with 4 inner slots, 1 bill compartment, 1 slot with an ID window, a snap closure, and a hanging key ring. Measures about 4 1/2inches tall X 8 3/4-inches long. Ages 14 and up.